I’ve been peripherally aware of The Burning Wheel from occasional jaunts into London where I would swing by Orc’s Nest. I never gave it a lot of thought other than to appreciate its fairly austere covers and paperback size. Then last weekend I went into The Gameskeeper for a copy of the awesome Dominion and came out with Burning Wheel Gold on an impulse. It looks kind of… grown up. It feels grown up. And I can tell you, it has grown up pretensions. I’ll say this first off: it feels complete. It feels like a finished product outside and in, which is nice. Luke Crane hasn’t just slapped the first two BW books into a hardback cover, he’s apparently reorganised the content for clarity. Good for him, I appreciate his efforts. The index is excellent, the writing is concise and clear, the text layout is legible. It’s also good value – it cost me 17 quid for a hardback book with nice paper. And I really like the small book format. Summerland, Spirit of the Century, Savage Worlds and Baron Munchausen are similar size, as are the Everway rulebooks (even if the box has to go on the oversize shelf). Feels much nicer in the hand, easier to read in bed. 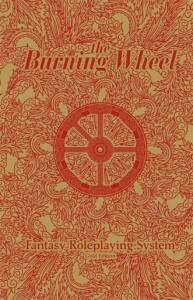 If you’re not careful, Burning Wheel will change the way you play roleplaying games. I had no idea I was skating the fringes of a cult. Looks like this guy wasn’t careful. OK, I don’t want to be mean. But for me, for more than 20 years, it’s been “all about the roleplaying”. But I’m open-minded enough to accept this system, which has committed following and a designer who clearly gives a damn about his product, could show me something new that will completely rock my world. Now, I don’t really write reviews, and if I did this wouldn’t be one of them because I’ve barely skimmed the text. So what I write from hereon is just first impressions. There’s some stuff I really, really like, and some stuff I really, really don’t. But I do intent to play through character creation, a few sample fights and a few other mechanics with an experienced GM when I’m on holiday in a couple of weeks. The system starts with letting me know that you roll a few d6 and look for successes, and that penalties and bonuses are applied as additional dice. Really? The great gaming revolution of the Burning Wheel (pun intended) is a dice pool system? Of course not. I get why we start with mechanics, how to test against skills, and how to advance them – you need these to frame the rest of the system. But it’s terribly dry for the first few chapters. It only really shows its potential when it starts talking in detail about Beliefs, Instincts and Traits. Setting out BITs for his character, a player states to the GM and the group what his goals in play are for this character. He lets everyone know how and when he wants to be rewarded for playing his character. I think I always knew that. But it’s quite exciting to see it written down. Now I think a few of my friends will be less impressed with, or possibly even object to the idea of a “social contract” between the gaming group and the GM. But I like the idea. Artha is like experience points – however it’s separate from advancement, which follows a Runequest like model. Artha is how the player gets rewarded for roleplaying. The basic idea is, if you roleplay to your beliefs you get Artha points which can be spent later on for boons to your rolls in perilous situations. I like the way Crane gives specific advice for what to award points for – up to a point. Much of the reward is geared towards “moving the story forward”. Some of the awards involve the whole group voting on Most Valuable Player, which I care less for. Frankly it sounds a bit like a mutual wanking session. Specifically, it sounds like the wanking we did at uni in the early 90’s with Vampire, before we realised we were all just psychopathic supers with fangs and piercings. Wanking’s OK. More power to the wankers. And I shouldn’t let my mild dislike of the presentation take away from the strength of the concept. The interaction between Belief and Artha, mechanically rewarding the players for playing to character, is truly exciting. Here it gets excessive. Maybe it’s just lack of familiarity, but I kind of resent any system with over 400 skills, especially when I can’t find the skill or career (sorry, lifepath) list online in a handout. Is everyone supposed to buy a copy? The lifepath idea is just as strong as WFRP‘s careers. Lifepaths are segments of one’s life that provide experience, and have certain lifepaths a PC can progress on to. The book recommends three lifepaths (2 career changes) for starting characters, and increasing the number of lifepaths for more experienced PCs. So much more organic and vivid than allotting points. You have paths offered for four races (men, elves, orcs and dwarves) and that’s it. Yes, it limits the usefulness if you object to a Tolkein-esque world, but frankly there’s enough variety provided by humans alone to make for an interesting group of PCs. One interesting feature is characteristics that apply to one race, or one section of society, and not others. Priests, for example, may have Faith while no-one else has. Again I like this feature a lot. Overall there’s an awful lot of crunch for what I expected to be a freeform, choice centred character generation based on the BIT system. And from hereon it just gets worse. I like breaking combat out into a mini game. I like the concept of “volleys” of three segments of actions. What repulses me is the sheer amount of crunch that comes along with it. Basically both sides (let’s call it GM and player) write down their actions in secret; then as each volley is played out, one side’s actions are cross-referenced with the other side to derive a skill test that may or may not be modified. I think there are options to change actions during each volley, but I’m not sure. I believe it’s supposed to be quick to resolve, which will be a big plus. But I’m at a loss to explain the process myself, let alone to my players. The number one question is, does being better at the mini game confer an advantage in combat for otherwise unskilled characters? Since the Fight! rules say “it’s a game where the unskilled can outwit the trained and win”, I’d say maybe yes. If the game is supposed to represent real combat, then I have serious reservations. It works on the basis that one can plan and not know what the opponent is going to do. The best swordsman in the world doesn’t need to fear the second best swordsman in the world; no, the person for him to be afraid of is some ignorant antagonist who has never had a sword in his hand before; he doesn’t do the thing he ought to. p>Twain has a point, although I can tell you that it’s a specific subset of ignorant (using Hope’s terminology) that poses the most threat; otherwise the actions of the unskilled are fairly predictable. This is why no model will ever be a better simulation than a single die roll weighted for physical attributes and circumstance. The Fight! system goes into excessive detail on combat manoeuvres. From what I read I don’t think there are any omissions (assuming a Counterstrike is synonymous with a Stop Hit). I need to playtest it to see if it works. I’ve got no objection to the mini-game as a way of playing through combat, especially if it’s quick and entertaining. But I fear that it will be neither – I will have to see. There are several areas I haven’t touched on. It’s not that they’re not useful, or interesting, it’s just that they’re not big features of the game for me. Steel for example is to do with coping with pain, shock and so forth; but there are several horror games that already deal with this well, if not in quite such an immediate way (hesitation is measured in heartbeats). Burning Wheel is uncompromising. Well, good, that seems to work for some people. I doubt that I will ever have the patience myself to devote enough time to running this game, much less find a group of players with the same patience. But I could be wrong. Maybe everything will fall into place when I try out some of the mechanics. I’ll report back. I’ve been meaning to check out Burning Wheel for ages. I’m holding off for now because I have a massive backlog of unread games from a sort of virtual garage sale I recently attended. It sounds really interesting. I’m particularly intrigued by inclusion of mental states like beliefs in the mechanics – something I’ve been thinking about a lot. My one worry with this system is that it rewards ruthlessly pursuing your goals. That’s fine for some games. But if your group does *not* think it’s cool and dramatic to backstab the entire group in order to achieve your goals, then this is potentially rewarding destructive behaviour. Maybe you can’t fix that with a mechanic, though. At character creation, everyone develops their Beliefs; it’s then up to the GM to weave them together. Actually I think played properly the game discourages selfish behaviour, rather than being vulnerable to it. Yes, it does reward individuals playing out their beliefs, but a big part of the game is driving the story (not individual goals) along, and that’s subject to the scrutiny of the group, not just the direction of the GM. Players are also able to alter their beliefs based on in-play events; if one PC backstabs the others, I reckon that character would become unplayable in the group.